I'm normally afraid of leave-in, frizz-fighting hair treatments. More often than not, they make my hair greasy and even less manageable than before I ran them through my locks. Not so with Avon ADVANCE TECHNIQUES Frizz Control Lotus Shield Anti-Frizz Treatment. The name is pretty long, so for the purposes of this post, let's just call it Lotus Shield from now on, shall we? Well. Lotus Shield has changed my life. I first tested this product on a high-humidity day, thinking there was no way on EARTH it would protect my strands from puffing up to mushroom cloud size around my head (the norm on a day when the air is drenched with moisture). Well, imagine my shock and delight when not only did my tresses stay flat and shiny throughout the entire day, but the product itself left no greasy residue or sticky feeling on even one strand! This was too good to be true, I thought, and decided to try again. This time I tested Lotus Shield before walking out in a snowstorm. Again, I expected my tresses to look terrible post-storm ... and, again, I was pleasantly surprised. Chalk it up to the lotus-inspired technology that creates a water-resistant layer on the hair ... or chalk it up to me FINALLY being lucky enough to find a frizz-fighting product that WORKS. Whatever the case, I'm so incredibly happy to finally have frizz-free tresses! 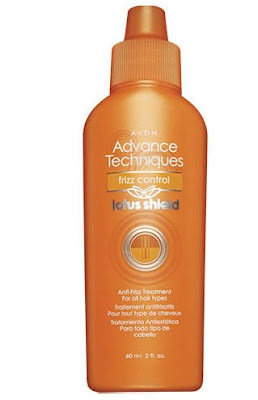 Avon ADVANCE TECHNIQUES Frizz Control Lotus Shield Anti-Frizz Treatment retails for $12 at avon.com. I have lots of thick, wavy hair which WANTS to blow up. I use this as a final step - just one or two drops - after blow drying, flat ironing or hot rollers and before styling. Warm between hands and run through hair, then finish combing, etc. The comments on this have been that it's a tiny bottle for that price, but it will last forever if used at the above rate. Also that it weighs down your hair. Well, everyone's hair is different, so experimenting is needed!